There are about a zillion four-year-olds named Emma in France right now. 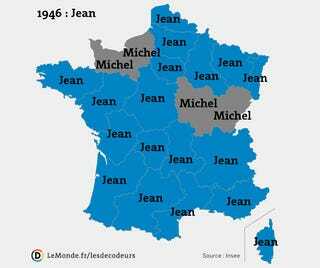 Much like the maps we made for the most popular names for baby girls (and the most popular names for baby boys), Le Monde's Alexandre Léchenet has created maps detailing the most-used names for girls and boys in France, from 1946 to 2011. For girls, Marie and Martine were popular the '50s; Nathalie had a long run in the late '60s and early '70s; the late '80s belonged to Elodie; and from 2004 to 2011, Emma dominated.